Who is this Website for? | What is an "Expat" or Expatriate? | Why Live & Work Overseas? Teach English Abroad: Enjoy Traveling and Seeing the World! what living overseas is all about. Our 60+ pages of will tell you the good and the bad about expatriate life. It's better to know before you go. Know that we have a bias. The author of this website has lived overseas since 1989, in five different countries and LOVES the lifestyle. BUT, we also know expatriate life is not for everyone and that is what we hope to do here. To help you discover if it is what is right for you. If living overseas will help improve the quality of your life. Start with the Super Expat FAQs to see what strikes your interest and what best fits your needs. Are you looking to retire or to work? Do you want to live well on a modest budget, make big money, save big money - or just kick back on a beach somewhere? Click on the link if you are interested in Teaching English Overseas - probably one of the easiest and fastest ways to get yourself overseas. If you have a degree - you can be easily saving US$1000+ per month in Korea in less than six weeks from today. Raise your hand if you'd like to spend your "working" time in a Luxury Resort . . . Teach English in a 5 Star Resort on a Tropical Island? The Hotel TEFL eBook has everything you need to teach in Paradise - The BEST way to earn a living Overseas. The ebook is very useful and I am more confident now when teaching our staff. 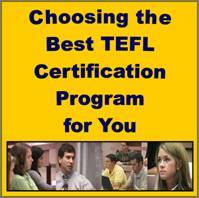 Here's how to do your TEFL right! The author of this website has lived and worked successfully in five foreign countries since 1989. But, he is not a doctor: get your medical advice from your physician before making any decisions about your personal health needs. The author is not a financial "expert". Make your personal financial decisions using your own best judgment and for anything more complicated than paying your water bill, consult a professional. The author is not a professional personal relationships counselor. Be sure to talk to your family, spouse, children, significant other, "partner" or anyone else involved in your decision making. Seek a professional counselor for anything that seems even mildly discomforting for you. Know that living overseas is not a good idea for people with mental health and/or relationship issues. Life overseas, in fact, offers a more challenging (and rewarding!) environment than you are used to in your home country. This website can offer you reliable advice that you can obtain only by sitting down and talking one-to-one with experienced expatriates for days - or even weeks. All that said, things change, things work for some people that may not work for others, the road of life can be bumpy sometimes. Things don't always go perfectly. One of the best things about living overseas is leaving behind that attitude of everyone blaming someone else for how their life has turned out. Overseas - it will be much more clear to you as to who is responsible for your life. YOU ARE. But you already know that and that is why you a here, looking for alternatives to improve your life. If any material on this website violates your copyright - please let us know immediately and we will remove the offending material or graphic. Contact Page for www.ExpatGuy.com: Questions? Comments? Do you Need a Will if Working Overseas? Do you Need to Speak the Local Language for an Overseas Job? Expatriate Investment: Invest in Old or New Country? Find Overseas Jobs There: Or in your Home Country? How Much Money can you Earn Save Working Overseas? How Quickly can I Find a Job Overseas? Should I use a Recruiter to find Overseas Employment? Should you Manage your Rental Property from Overseas? Special Diets While Working Overseas? Vegan? Kosher? Halaal? What is Xenophobia and Jingo-ism? What Should I Keep vs. Sell? What's the Best way to Contact Overseas Employers? Why Work Overseas? Why do People Work Overseas?